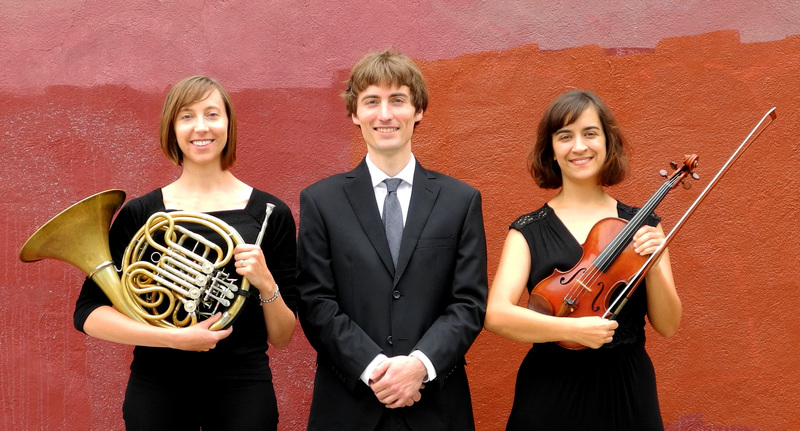 The Boston-based Red Hedgehog Trio (Marina Krickler, horn; Marji Gere, violin; Dan Sedgwick, piano) is dedicated to exploring and expanding the repertoire for horn, violin & piano. In a nod to Johannes Brahms’ seminal trio for this instrumentation, the group borrows its name from Brahms’ favorite Viennese coffee house, Zum Roten Igel – The Red Hedgehog. RHT is available for recitals, educational performances, and recording projects in the Greater New England area. Past venues have included the Music in Bass Hall Concert Series (Peterborough, NH), Third Life Studio (Somerville, MA), the Whitney Center for the Arts (Pittsfield, MA), Winchester Community Music School (Winchester, MA), and The Boston Conservatory. Believing strongly in the value of community music-making, RHT has received grants from the Somerville Arts Council, and Pittsfield Cultural Council, and have partnered with Equilibrium Concert Series. In the same vein, they have given educational performances at Berkshire, Holyoke, and Middlesex Community Colleges. RHT has enjoyed summer residencies at Avaloch Farm Music Institute (Boscawen, NH), and Hill and Hollow Music (Saranac, NY), which have included multiple outreach performances. Committed to expanding horizons for their instrumentation, in 2015 RHT launched a commissioning project, resulting in the performance and recording of 10 X 10: Ten Miniature Trios by Ten Composers. RHT concerts have included world premieres of several other new works, including: Burlesque by Raphael Atlas, RIDE (for a Lady Wheeler) for Voice, Violin, & Piano (text by Marji Gere & Tamara Plummer; music by Dan Sedgwick), Preludes by Dan Sedgwick, and Marina Krickler’s transcription of Gabriel Fauré’s Piano Trio, Op. 120. A native of Calgary, Alberta, Marina was drawn to the horn in high school, at the encouragement of her band director. She earned a Music Performance Diploma from Mount Royal University in 2005, where she studied with Laurie Matiation. She went on to complete a Bachelor’s of Music in Performance from the University of Toronto in 2008, where she studied with Gabe Radford. In 2010, Marina earned a Master’s of Music in Performance from The Boston Conservatory, under the tutelage of Eli Epstein. She has also participated in a number of summer festivals, including National Academy Orchestra, and National Youth Orchestra of Canada. Currently, Marina performs with a variety of ensembles, including Atlantic Symphony Orchestra, Plymouth Philharmonic, and New Bedford Symphony Orchestra. As a soloist, she recently performed Mozart’s Concerto No. 4 with Haffner Sinfonietta. Believing strongly in the value of music education, Marina is on faculty at Winchester Community Music School, Wellesley Public Schools, and Dana Hall School of music. Learn more about Marina here. Marji grew up in Davenport, Iowa, a city known for its musically rich public school system. She earned Bachelor’s degrees in Music and English from the University of Iowa in 2002, where she studied violin and chamber music with Annette-Barbara Vogel, the Maia Quartet, and the late Leopold LaFosse. In 2007, she earned a Master’s in Arts in Education from the Harvard Graduate School of Education. Marji’s education and career have taken her into many realms: she has taught creative writing, worked in the forms of visual art, theater, and puppetry, and conducted research in second language teaching and learning. During 2002-2005, she was a fellow of the US State Department’s Cyprus-America Scholarship Program, investigating the role of chamber music in conflict resolution in Cyprus. From 2009-2014, Marji taught violin, viola, and chamber music to students in Mattapan, MA through the organization musiConnects, and performed as violinist of the Boston Public Quartet. Currently, Marji teaches violin and piano in Somerville and performs in a variety of chamber music settings, on baroque and modern violin. Learn more about Marji here. Dan Sedgwick is a composer, pianist, and teacher whose work focuses on instrumental and vocal chamber music. Dan was born and raised in Worcester, MA, where he attended the Music Magnet at Burncoat Public High School, studying piano and basic music theory, eagerly performing with and composing for ensembles large and small, and dabbling in french horn and classical guitar. Dan went on to concentrate in music as an undergraduate at Harvard, and earned his doctorate in composition from Rice University in 2009. As a pianist and harpsichordist, he embraces a wide-ranging repertoire; in addition to his work with the Red Hedgehog Trio, his recent recordings include the Complete Sonatas for Harpsichord and Viola da Gamba by J.S. Bach (with Richard Hartshorne, double bass, 2014); and a guest appearance on singer-songwriter Kris Wettstein’s album, For Nothing Holds You In (2014). Dan’s compositions have been performed by the Boston Public Quartet, Apple Hill String Quartet, Worcester Chamber Music Society, Gryphon Trio, Keene Chamber Orchestra, Magnolia Chamber Orchestra, Houston Boychoir, and many others. In some recent compositional work—including commissions from the Dilijan Chamber Music Series of Los Angeles, CA and the SONAD Peace Project of NH—Dan has collaborated with violinist and wordsmith Marji Gere to combine music with spoken text, resulting in unique pieces of theatrical chamber music.